I love this mod.. It hits reality nice.. It has a great look with machining & ergonomics.. It does show arcing but has little to no effect on preformance.. I've had a few no fire switch hits but a quick contact cleaning & golden again.. Thx for such a speedy delivery & awesome customer service..
i recently procured this mod from subtank supply. i will admit the shipping was surprizingly quick which worked out really well because i was very eager to checkout this mod. 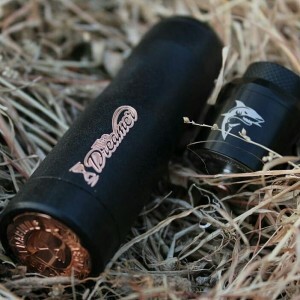 the price of this mod alone is an amazing price but once you realize what you got for the price you will probably feel like you got away with something. because when i recieved mine i couldnt believe the quality of the product. the ergonomic shape of the mod is not overly milled. which has been done on alot of mods these days. this one is perfect. its as though someone has molded a hand and made the mod to fit perfectly. the ability of 21/20700, and 18650 batteries is almost and should be an industry standard. this mod also "hits" like a champ. i must admit that Stan did a fantastic job designing this mod. the button configuration is awesome and i would love to see more mods like this. i must admit that i am about to make a second purchase. i have the copper, and i must have the brass now. all i can say, basically is....get it. you can thank me later.